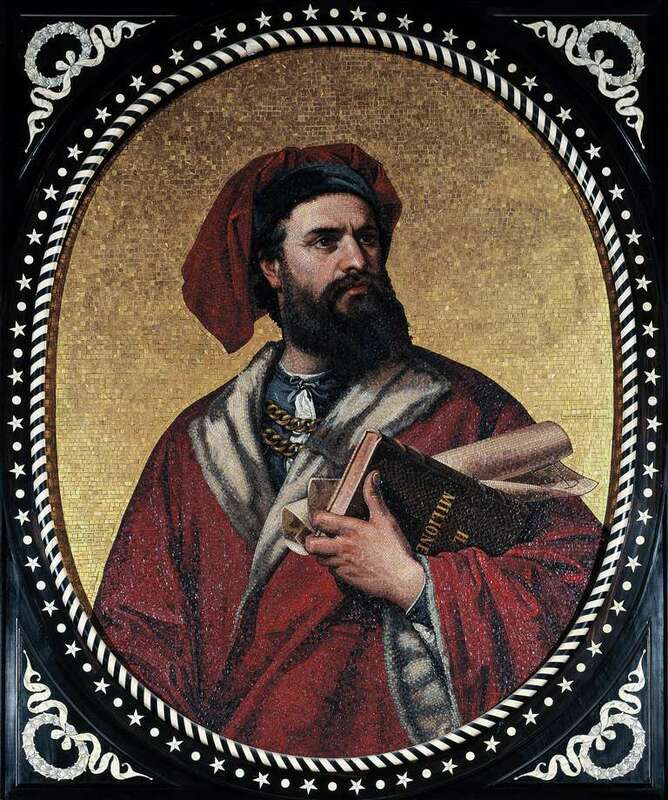 Marco Polo was a Venetian merchant and explorer who followed in the footsteps of his father and uncle. His writings about China and the Mongol Empire in Travels of Marco Polo had a significant impact on European beliefs about and behavior toward the East, and inspired the travels of Christopher Columbus. Marco Polo was born into a prosperous merchant family in 1254 in what was then the Italian city-state of Venice. His father Niccolo, and Uncle Maffeo had already left Venice for a trading trip before Marco was born, and Marco's mother died before the expedition returned. As a result, young Marco was raised by relatives. Meanwhile, Marco's father and uncle traveled to Constantinople (modern-day Istanbul), encountering Mongol uprisings and the Byzantine re-conquest of Constantinople along the way. The brothers then headed east to Bukhara (modern-day Uzbekistan), and, from there, were encouraged to meet with the great Mongolian emperor Kublai Khan (the grandson of Genghis Khan) in his court in what is now Beijing. Kublai Khan took a liking to the Italian brothers and learned a great deal from them about European culture and technology. A few years later, Kublai Khan sent the Polo brothers back to Europe on a mission to the Pope, asking that missionaries be sent to convert the Mongols (no mission was ever sent). By the time the Polos returned to Venice the year was 1269; Niccolo discovered that his wife had died in the interim, leaving him a 15-year-old son. The father, uncle, and son got along well; two years later, in 1271, the three left Venice once again, heading east. Marco, his father, and his uncle sailed across the Mediterranean and then set over overland, crossing Armenia, Persia, Afghanistan and the Pamir Mountains. Finally, they set off across the Gobi Desert to China and Kublai Khan. The entire journey took about four years, including a period during which the group stayed in the mountains of Afghanistan while Marco recovered from illness. Despite the hardships, Marco discovered a lust for travel and a desire to learn as much as he could about the cultures he encountered. Upon reaching Beijing, the Polos were welcomed to Kublai Khan's legendary marble and gold summer palace, Xanadu. All three men were invited to join the emperor's court, and all three immersed themselves in Chinese language and culture. Marco was appointed to become a "special envoy" to the emperor which entitled him to travel throughout Asia, thus becoming the first European to see Tibet, Burma, and India. His service to the emperor was exemplary; as a result, he received the titles of Governor of a Chinese city and earned a seat on the emperor's council. After a successful stay of more than 17 years in China, the Polos had become extraordinarily wealthy. They finally left as the escorts to a Mongolian princess named Cogatin, who was to become the bride of a Persian prince. Though they had the use of a fleet of Chinese ships, the voyage home was unlucky: during the voyage, hundreds of passengers and crew members died. When they reached Persia, the bride's Persian prince had died as well, leading to a delay while the right match was found for the young princess. During the multi-year ship, Kublai Khan himself died; this left the Polos vulnerable to local rulers who exacted taxes from the Polos before they were allowed to leave. The Polos returned to Venice as strangers in their own land. When they arrived, Venice was at war with the rival city-state of Genoa. As was the custom, Marco funded his own warship, but he was captured and imprisoned in Genoa. While in prison for two years, Marco Polo dictated an account of his travels to a fellow prisoner (and author) named Rusticello. In 1299, the war ended and Marco Polo was released; he returned to Venice, married Donata Badoer, and had three daughters while reviving his successful business. During this time, The Travels of Marco Polo was published in French. Published before the invention of the printing press, the book was copied by hand by scholars and monks, and each of the surviving 130 or so copies is different. Over time, the book was translated into many different languages and distributed worldwide. At the time of its publication, few readers believed that the book was literally accurate, and many questioned whether it was written by Polo or Rusticello. It seems likely that much of the book is hearsay, as some is written in the first person and some in the third person. Nevertheless, most of the contents of the book's description of Kublai Kahn's court and customs have been authenticated by historians. In addition to accurate first-hand descriptions of Asian customs, Marco Polo's book also provided Europe's introduction to paper money, coal, and other important innovations. 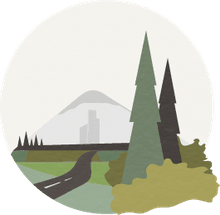 At the same time, however, it includes stories of people with tails, lands peopled almost entirely by cannibals and other impossible or unlikely claims. Throughout this province there is found a sort of black stone, which they dig out of the mountains, where it runs in veins. When lighted, it burns like charcoal, and retains the fire much better than wood; inso- much that it may be preserved during the night, and in the morning be found still burning. These stones do not flame, excepting a little when first lighted, but during their ignition give out a considerable heat. Now you must know that in this kingdom of Lambri there are men with tails; these tails are of a palm in length, and have no hair on them. These people live in the mountains and are a kind of wild men. Their tails are about the thickness of a dog's. There are also plenty of unicorns in that country, and abundance of game in birds and beasts. Marco Polo spent his final days as a businessman, working from home. He died there at almost 70 years of age, on January 8, 1324, and was buried under the church of San Lorenzo, though his tomb has now vanished. As Polo neared death in 1324, he was asked to recant what he had written and simply said that he had not even told half of what he had witnessed. Despite the fact that many claim his book to be unreliable, it was a sort of regional geography of Asia for centuries, serving as inspiration for Christopher Columbus who took an annotated copy along on his voyages in 1492. Even today, it is considered one of the great works of travel literature. “The Travels of Marco Polo/Book 3/Chapter 11.” Codex Hammurabi (King Translation) - Wikisource, the Free Online Library, Wikimedia Foundation, Inc., en.wikisource.org/wiki/The_Travels_of_Marco_Polo/Book_3/Chapter_11.